Are my cell phone pictures really stalking me? There is a not-so-great bit of reporting going around lately that's designed to warn people about GPS tracking capabilities on mobile phones. Basically, the story points out that cell phones today are capable of embedding your location into photos. The story suggests that such data can later be extracted by would-be predators who are interested in finding your location. To support their findings the reporters identify the location of a young child using a photo posted online. They then go to the mother's home and inform her that the photo contains the exact coordinates of the child's bedroom. All of this, of course, sounds really scary if you are a parent who is used to posting pictures of your kids on sites like Facebook. One friend recently became so fearful that she removed all of her photos from her social network site. So it seemed to me that this might be a good time to elaborate where the media hasn't been so clear. The actual facts, about what happens to your photos are a little more complicated than the story would make it appear, and in all likelihood what you've posted to your social media site doesn't have any location data in it, though your cell phone might. Let me explain. It is true that most cell phones today do have location sensing capabilities that use geotagging. This simply means that your cell phone is capable of tracking you, and that it can assign a location to various content that you create. This feature is used for all sorts of reasons. It's used to locate you in the event of a 911 call. It's what allows you to use your navigational maps on your phone. And for those FourSquare addicts, it's what helps you become the Mayor of some small town in the middle of Arkansas. It is also true that most cell phone photos contain this information. 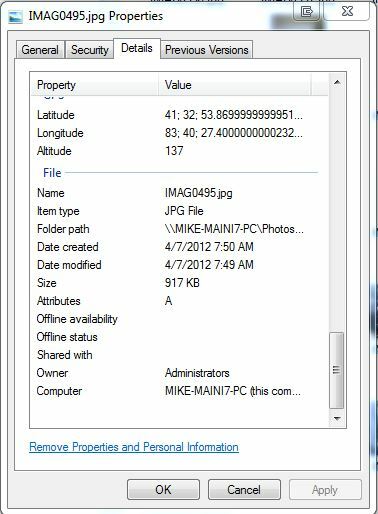 The information we're talking about is called a GeoCoordinate and it is stored in a photo in what is called EXIF data. While that may sound like another language, it's just a fancy way of saying that your photos contain information that you can't see, but that a computer can read. Take the picture to the right, for example. 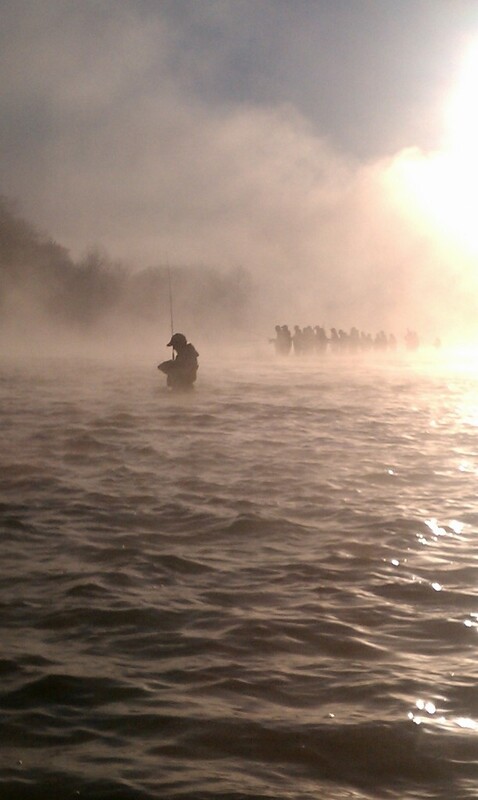 This is a photo that I took with my cell phone while fishing on the Maumee River near Toledo, Oh. When I took the image, my cell phone automatically added my exact location. This data is visible in the "properties " of the photo. Below is an example of how the data looks when you look at the photo's properties in Windows. If you have a Windows system you can find the data by right clicking on the photo and selecting "Properties" then the "Details" tab. Scroll down until you see the GPS coordinates. To find the information on a Mac, open the photo in Preview Mode. Then press the "Command" key and the letter "i" to open the inspector. Then click the "i" tab and select the EXIF or GPS option. If no coordinates are listed using either of these methods then your phone isn't recording a location. Okay, so what does this data do? If your phone shows something like the image on the left with both latitude and longitude recording a location, then congratulations, you've got GeoCoordinates! These coordinates essentially record the exact location that you were standing on the planet at the time the image was taken. In other words, every time you snap a picture, your phone is programmed to record your location and embed that location into the properties of that photo. It does this by talking to cell phone towers, wireless access points and satellite signals that are all around you. All of this data is used to pin point a pretty accurate location of where you are standing. If you have such coordinates then it's pretty easy for a person to find out where you were just by simply checking the properties of the photo. Journalists should be particularly aware of the existence of this data when taking pictures of sensitive subjects. For example, last year Vice.com found itself in an embarrassing situation when journalists at Vice uploaded a photo of John McAfee's, who was in hiding at the time. The location wasn't so secret once a blogger discovered and extracted McAfee's geocoordinates on the web. Soon after he had a visit from the police, and no doubt a Vice reporter just lost a lot of credibility. To illustrate how this works, I've taken the coordinates from the photo above and I've entered them into a Google map search. You'll notice that coordinates in the map are the same as the latitude and longitude listed in the photo properties above. The location is so accurate that it identifies the exact location where I was standing in the river. The fishing there, by the way, was pretty good, though I'd suggest you show up early if you want to give it a try. It's shoulder-to-shoulder when the fishing's hot….but I digress. So should I be concerned? So far we've seen that your cell phone is capable of recording your location, and that it is so accurate that it can locate your whereabouts within a few feet of where you are standing. Sounds pretty scary right? After all, we've all seen Enemy of the State where Gene Hackman is forced to flee from the U.S. government and blow up his hideout simply because Will Smith made a phone call. We know what the government does with this kind of data, and we know it always ends badly for the little guy. But before you put on your tin foil hat, delete all your social media posts, and book a one way ticket to Tajikistan, take a breath. That isn't the whole story. It's very possible that your photos are safe. While it is true that your cell phone photos probably have your data, it isn't true that uploading those images to the web automatically makes your location available. A recent study found that Facebook and Twitter automatically strip this data away from your photos once they've been uploaded to your social media sites. Instagram's policy is to turn off geotagging unless you opt in to the service. In other words, when a person downloads a photo you've posted to one of these sites, then the geocoordinates have already been removed. For you that means that even if some random creeper got ahold of your photos, he couldn't use your photos to track you. However, that isn't the case with every social media site. For example, the same study above noted that Google Plus does include location. And if you're hosting images in FlickR then chances are that your geocoordinates are available for download. The same is true for cloud based services like Google Drive and Drop Box. Both of these sites simply make a copy of your original photos, so if the data is there, then it is accessible to any person that has access to your photos. So there you have it, a basic primer on how GPS data works. While it might make an enticing headline to claim that social media sites are opening you up to privacy concerns, in this case, that's not the whole story. The best advice I can give you is to know the policies of the sites your posting to. It may be in the future that social media sites like Twitter, Facebook and Instagram decide to include GPS data in your images, but for now, you can sleep soundly knowing that your photo data is safe.